- Special awards will be assessed by César Astudillo (Gominolas), Jon Ritman and Víctor Ruíz exclusively. - Games awarded with a special mention will be given the special quality seal with the name of the award. - A physical cassette edition with all presented games will be created and distributed. - An additional 5 points will be given to games including any kind of gesture to the game Camelot Warriors (Dinamic, 1986) for his 30th aniversary. Par contre, ton sujet est le "464" ième dans "News-Actualité"! Mais, j'avoue que de nombreuses personnes y regarderont à deux fois, avant de corrompre ce joli nombre! au tour de Reidrac (Juan Martinez J) avec un screen pour Magica (pseudo-snow bross) prévu pour novembre. ooooooooooh, certaines captures attisent ma curiosité! C'est très joli! Houla, les places vont être chères . Certains screenshots sont vraiment mignons (mon préféré est Outlaws), ça donne envie ! 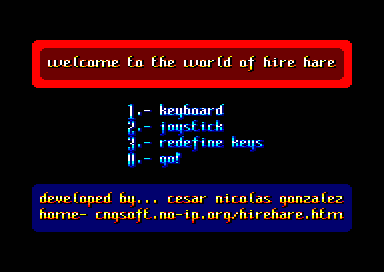 The files have already been delivered to the CPC RetroDev 2016 organisation, so here's a two-minute video of my videogame "Hire Hare" in action. ou en anglais par moment.